"Ghazw" redirects here. For other terms derived from this one, see Razzia. "Ghazis" redirects here. For other uses, see Ghazi. "Gazi" redirects here. For other uses, see Gazi (disambiguation). "Ghaza" redirects here. For the city in the Gaza Strip, see Gaza City. Mughal era illustration of Pir Ghazi of Bengal. Ghazi (Arabic: غازي‎, ġāzī) originally referred to individuals who participated in ghazw (غزو, ġazw), meaning military expeditions or raiding. The latter term was applied in early Islamic literature to expeditions led by the Islamic prophet Muhammad, and later taken up by Turkic military leaders to describe their wars of conquest. In the context of the wars between Russia and the Muslim peoples of the Caucasus, starting as early as the late 18th century's Sheikh Mansur's resistance to Russian expansion, the word usually appears in the form gazavat (газават). Other forms of the term have been used in recent times by jihadist groups. In English language literature, the word often appears as razzia, a borrowing through French from Maghrebi Arabic. It modern Turkish, it is used to refer to soldiers who are hurt during battle, and also as a title for Turkic champions such as Ertuğrul, Osman Gazi and Mustafa Kemal Atatürk. In pre-Islamic Bedouin culture, ghazw[a] was a form of limited warfare verging on brigandage that avoided head-on confrontations and instead emphasized raiding and looting, usually of livestock (see cattle raiding). The Umayyad-period Bedouin poet al-Kutami wrote the oft-quoted verses: "Our business is to make raids on the enemy, on our neighbor and our own brother, in the event we find none to raid but a brother." (Semi-institutionalized raiding of livestock herds was not unique to the Bedouins; the Soviet anthropologists adopted the Kazakh word barymta to describe similar practices of nomads in the Eurasian steppes, and similar dynamics were widespread in pre-feudal Ireland.) William Montgomery Watt hypothesized that Muhammad found it useful to divert this continuous internecine warfare toward his enemies, making it the basis of his war strategy; according to Watt, the celebrated battle of Badr started as one such razzia. As a form of warfare, the razzia was then mimicked by the Christian states of Iberia in their relations with the taifa states; rough synonyms and similar tactics are the Iberian cavalgada and the Anglo-French chevauchée. The word razzia was used in French colonial context particularly for raids to plunder and capture slaves from among the people of Western and Central Africa, also known as rezzou when practiced by the Tuareg. The word was adopted from ġaziya of Algerian Arabic vernacular and later became a figurative name for any act of pillage, with its verb form razzier. 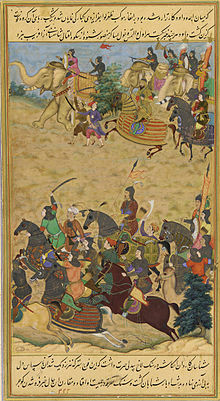 Young Akbar assumed the title Badshah Ghazi after leading a Mughal Army of 10,000 during the Second Battle of Panipat, against more than 30,000 mainly Hindu adversaries led by Hemu. The Ottoman Ghazi's defeat the Crusaders during the Battle of Nicopolis. Ghazi (Arabic: غازي‎, ġāzī) is an Arabic word, the active participle of the verb ġazā, meaning 'to carry out a military expedition or raid'; the same verb can also mean 'to strive for' and Ghazi can thus share a similar meaning to Mujahid or "one who struggles". The verbal noun of ġazā is ġazw or ġazawān, with the meaning 'raiding'. A derived singulative in ġazwah refers to a single battle or raid. The term ghāzī dates to at least the Samanid period, where he appears as a mercenary and frontier fighter in Khorasan and Transoxiana. Later, up to 20,000 of them took part in the Indian campaigns of Mahmud of Ghazni. Ghāzī warriors depended upon plunder for their livelihood, and were prone to brigandage and sedition in times of peace. The corporations into which they organized themselves attracted adventurers, zealots and religious and political dissidents of all ethnicities. In time, though, soldiers of Turkic ethnicity predominated, mirroring the acquisition of Mamluks, Turkic slaves in the Mamluk retinues and guard corps of the caliphs and emirs and in the ranks of the ghazi corporation, some of whom would ultimately rise to military and later political dominance in various Muslim states. In the west, Turkic ghāzīs made continual incursions along the Byzantine frontier zone, finding in the akritai (akritoi) their Greek counterparts. After the Battle of Manzikert these incursions intensified, and the region's people would see the ghāzī corporations coalesce into semi-chivalric fraternities, with the white cap and the club as their emblems. The height of the organizations would come during the Mongol conquest when many of them fled from Persia and Turkistan into Anatolia. As organizations, the ghazi corporations were fluid, reflecting their popular character, and individual ghāzī warriors would jump between them depending upon the prestige and success of a particular emir, rather like the mercenary bands around western condottiere. It was from these Anatolian territories conquered during the ghazw that the Ottoman Empire emerged, and in its legendary traditions it is said that its founder, Osman I, came forward as a ghāzī thanks to the inspiration of Shaikh Ede Bali. In later periods of Islamic history the honorific title of ghāzī was assumed by those Muslim rulers who showed conspicuous success in extending the domains of Islam, and eventually the honorific became exclusive to them, much as the Roman title imperator became the exclusive property of the supreme ruler of the Roman state and his family. The first nine Ottoman chiefs all used Ghazi as part of their full throne name (as with many other titles, the nomination was added even though it did not fit the office), and often afterwards. However, it never became a formal title within the ruler's formal style, unlike Sultan ul-Mujahidin, used by Sultan Murad Khan II Khoja-Ghazi, 6th Sovereign of the House of Osman (1421–1451), styled 'Abu'l Hayrat, Sultan ul-Mujahidin, Khan of Khans, Grand Sultan of Anatolia and Rumelia, and of the Cities of Adrianople and Philippolis. Ghazi was also used as a title of honor in the Ottoman Empire, generally translated as the Victorious, for military officers of high rank, who distinguished themselves in the field against non-Moslem enemies; thus it was conferred on Osman Pasha after his famous defence of Plevna in Bulgaria and on Mustafa Kemal Paşa (later known as Mustafa Kemal Atatürk) for leading the defense against the Gallipoli campaign. Some Muslim rulers (in Afghanistan) personally used the subsidiary style Padshah-i-Ghazi. Ghazwah, which literally means "campaigns", is typically used by biographers to refer to all the Prophet’s journeys from Medina, whether to make peace treaties and preach Islam to the tribes, to go on ʽumrah, to pursue enemies who attacked Medina, or to engage in the nine battles. Muhammad participated in 27 Ghazwa. The first Ghazwa he participated in was the Invasion of Waddan in August 623, he ordered his followers to attack a Quraysh caravan. The only way of avoiding the onslaughts of the ghāzīs was to become subjects of the Islamic state. Non-Muslims acquired the status of dhimmīs, living under its protection. Most Christian sources confuse these two stages in the Ottoman conquests. The Ottomans, however, were careful to abide by these rules... Faced with the terrifying onslaught of the ghāzīs, the population living outside the confines of the empire, in the 'abode of war', often renounced the ineffective protection of Christian states, and sought refuge in subjection to the Ottoman Empire. Peasants in open country in particular lost nothing by this change. A good source on the conduct of the traditional ghazw raid are the medieval Islamic jurists, whose discussions as to which conduct is allowed and which is forbidden in the course of warfare reveal some of the practices of this institution. One such source is Averroes' Bidāyat al-Mujtahid wa-Nihāyat al-Muqtasid (translated in Peters, Jihad in Classical and Modern Islam: A Reader, Chapter 4). In the 19th century, Muslim fighters in North Caucasus who were resisting the Russian military operations declared a gazawat (understood as holy war) against the Russian Orthodox invasion. Although uncertain, it is believed that Dagestani Islamic scholar Muhammad Yaragskii was the ideologist of this holy war. In 1825, a congress of ulema in the village of Yarag declared gazawat against the Russians. Its first leader was Ghazi Muhammad; after his death, Imam Shamil would eventually continue it. During the Second Chechen War, Chechnya announced gazawat against Russia. After the terrorist attacks on Paris in November 2015, the Islamic State group is said to have referred to its actions as "ghazwa". Probably the most famous use of the term "ghazwa" is in the phrase 'Manhattan Raid', used by Al-Qaeda to refer to the September 11th attacks. Islamist and Jihadist terrorist organizations, such as Al-Qaeda, Islamic State, Ansar Ghazwat-ul-Hind (AGH) and Islamic State in Jammu and Kashmir (ISJK), etc, frequently call for waging of Ghazwa-e-Hind (war of conquest and conversion against the land of Hindus), in reference to Hadith of Ghazwa-e-Hind. ^ Aboul-Enein, H. Yousuf and Zuhur, Sherifa,"Islamic Rulings on Warfare", Strategic Studies Institute, US Army War College, Diane Publishing Co., Darby PA, ISBN 1-4289-1039-5 pg. 6. ^ Paul Wheatley (2001). The places where men pray together: cities in Islamic lands, 7th through the 10th centuries. University of Chicago Press. p. 11. ISBN 978-0-226-89428-7. ^ A. J. Cameron (1973). Abû Dharr al-Ghifârî: an examination of his image in the hagiography of Islam. Royal Asiatic Society : [distributed] by Luzac. p. 9. ISBN 978-0-7189-0962-8. ^ Anatoly Michailovich Khazanov (1984). Nomads and the outside world. Univ of Wisconsin Press. p. 156. ISBN 978-0-299-14284-1. ^ William Montgomery Watt; Pierre Cachia (1996). A history of Islamic Spain. Edinburgh University Press. pp. 6–7. ISBN 978-0-7486-0847-8. ^ William Montgomery Watt (1978). "Muhammad". In Ann Katherine Swynford Lambton; Bernard Lewis (eds.). The central islamic lands from pre-islamic times to the first world war. Cambridge University Press. p. 45. ISBN 978-0-521-29135-4. ^ Cathal J. Nolan (2006). The age of wars of religion, 1000-1650: an encyclopedia of global warfare and civilization. Greenwood Publishing Group. p. 724. ISBN 978-0-313-33734-5. ^ Cathal J. Nolan (2006). The age of wars of religion, 1000-1650: an encyclopedia of global warfare and civilization. Greenwood Publishing Group. p. 718. ISBN 978-0-313-33734-5. ^ Lokman (1588). "Battle of Nicopolis (1396)". Hünernâme. Archived from the original on 2013-05-29. ^ Ahmed Al-Dawoody (2011), The Islamic Law of War: Justifications and Regulations, p. 22. Palgrave Macmillan. ISBN 9780230111608. ^ Galina M. Yemelianova (2002). Russia and Islam: a historical survey. Palgrave Macmillan. p. 50. ISBN 978-0-333-68354-5. ^ Ibrahim, Ayman S. (16 November 2015). "4 ways ISIS grounds its actions in religion, and why it should matter (COMMENTARY)". Washington Post. Retrieved 17 November 2015. ^ "Al-Qaeda in Indian subcontinent getting more active: US experts". indiatimes.com. Retrieved 2019-01-13. ^ "Ansar Ghazwat ul-Hind / Foundation of New Movement of Jihad in Kashmir (AGH)". trackingterrorism.org. Retrieved 2019-01-13. ^ "ISJK calls Geelani kafir for being MLA". dailypioneer.com. Retrieved 2019-01-13. This article incorporates text from a publication now in the public domain: Chisholm, Hugh, ed. (1911). "Ghazi" . Encyclopædia Britannica (11th ed.). Cambridge University Press. "Ghazw". Encyclopedia of Islam (CD-ROM v. 1.0 ed.). Brill. 1999. "Ghāzī". Encyclopedia of Islam (CD-ROM v. 1.0 ed.). Brill. 1999. Rid, Thomas (2009). "Razzia: A Turning Point in Modern Strategy". Terrorism and Political Violence. 21 (4): 617–635. doi:10.1080/09546550903153449. Mohammed Bamyeh (2006). "The Nomands of Pre-Islamic Arabia". In Dawn Chatty (ed.). Nomadic societies in the Middle East and North Africa: entering the 21st century. BRILL. pp. 33–49. ISBN 978-90-04-14792-8.